You can map backup copy jobs only to backups created with the incremental backup method. 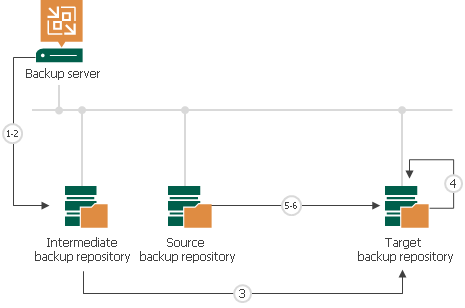 If the backup is created with the reverse incremental backup method or the backup chain contains both incremental and reverse incremental restore points, Veeam Backup & Replication will display a warning, and you will not be able to map a backup copy job to such backup. To overcome this limitation, you can use a workaround scenario. You can configure a backup copy job to produce a full backup file out of the reverse incremental backup chain, transfer this full backup file to the target backup repository, and remap the backup copy job to the transferred full backup file. Create a backup copy job. Add machines whose restore points you want to copy to this backup copy job. Target the backup copy job to some backup repository on the source side. This backup repository will be used as an intermediate one. Run the backup copy job to create a full backup file (VBK) in the intermediate backup repository. Transfer the created VBK file and VBM file from the intermediate backup repository to the target backup repository. Perform repository rescan to populate the target backup repository. If the initial backup file was encrypted, you will need to enter a password to unlock the full backup file. Otherwise, Veeam Backup & Replication will not display the full backup file in the list of backups on the backup repository. For more information, see Importing Encrypted Backups. Remap the backup copy job to the full backup file that you have created and transferred to the target backup repository. Click Sync Now to start a new backup copy interval. As a result, Veeam Backup & Replication will use the full backup file as a seed. When a new restore point for the machine is available in the source backup repository, Veeam Backup & Replication will copy it to the target backup repository and store it next to the full backup seed. That is, if you have a backup chain whose earliest restore point is 1 week old, you need to set the backup copy interval to 1 week. If you set the backup copy interval to a smaller time interval, for example, 1 day, all restore points that are older than 1 day will fall out of the search scope, and Veeam Backup & Replication will not transfer such restore points. For more information, see Restore Point Selection.